Gleeksters! My apologies for the delay on my track-by-track review of Glee: The Music, Volume 2, but it’s finally ready for your reading pleasure! Overall this album was about as equally entertaining as the first soundtrack, with some clear stand-out tracks and some that you might consider skipping over. Read on to see which songs I loved and which ones didn’t quite make the cut, and if you missed it the first time around, be sure to check out my track-by-track review of Glee: The Music, Volume 1! 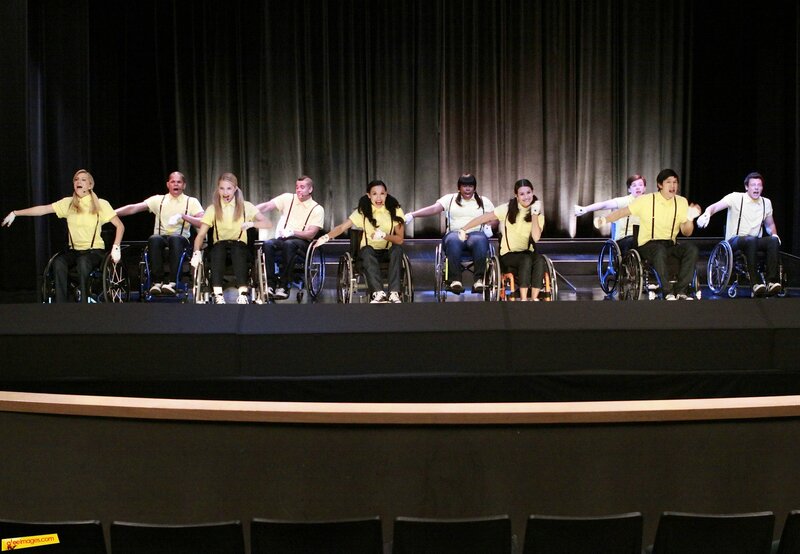 "Proud Mary": Seeing all the gleeks singing and dancing in wheelchairs? Amazing. 1. 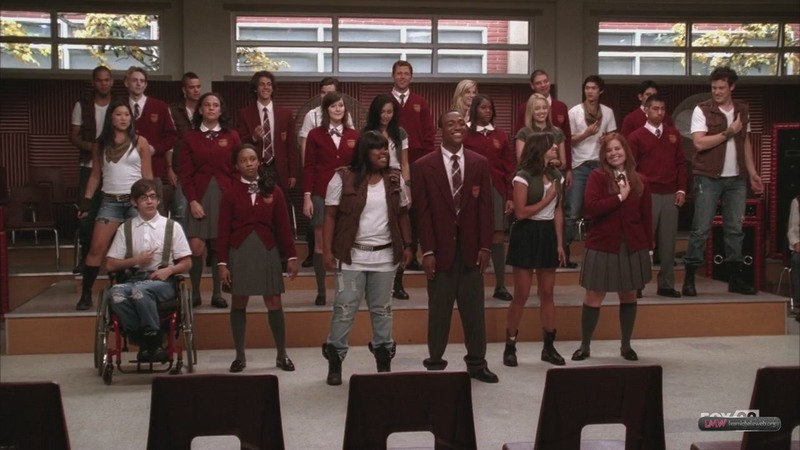 “Proud Mary”: This song automatically gets a positive vote from me because it’s one of my favourite songs of all time, but even putting that aside, the gleeks’ version is totally awesome. Kevin McHale and Amber Riley rock on lead vocals, the build-up from “nice and easy” to “rough” (as Tina Turner herself puts it) is perfectly executed, and it’s just all-around ridiculous fun. Easily one of my fave tracks on this album. 2. “Endless Love”: These two former Broadway stars (Lea Michele and Matthew Morrison) do sound beautiful together, but the creepiness factor is still evident even without seeing Rachel chase Mr. Schue around the piano! Their voices are gorgeous and blend together well, but still, this song’s a bit too over-the-top sappy for me. 3. “I’ll Stand By You”: Although this song is rather obviously over-produced and auto-tuned, I love the original version and Cory Monteith does a solidly emotional rendition of it. When you think about the fact that he’s singing this song to his unborn child that isn’t actually his unborn child, you can get roped into the sadness of this song really easily. "Don't Stand So Close to Me (Young Girl)": Will (Matthew Morrison) sings rather emphatically about how Rachel and Emma need to keep their distance from him. 4. “Don’t Stand So Close to Me (Young Girl)”: Matthew Morrison’s voice is fantastic on this song. And the song itself – have I mentioned before how awesome the mash-up of these two songs are? He’s singing to Rachel about how she needs to stay the hell away from him, and he’s singing to Emma about how he needs to stay the hell away from her…because he wants her so badly. He conveys both emotions perfectly and it’s so much fun to listen to. 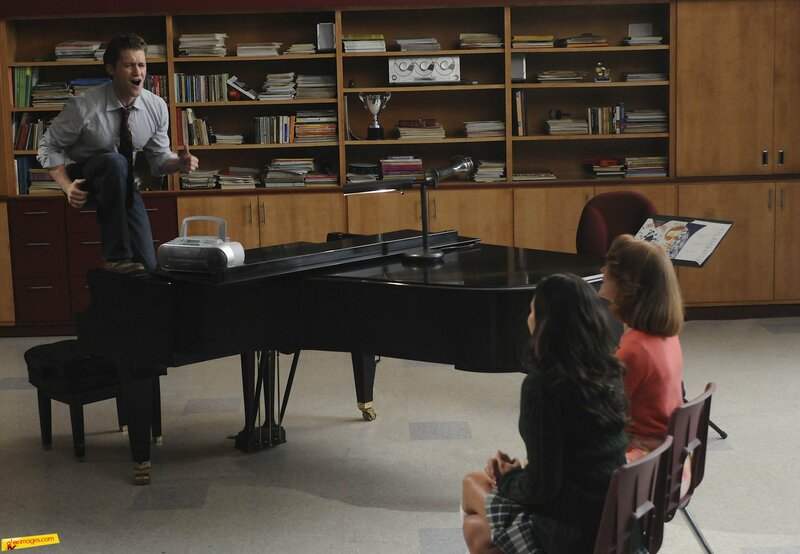 A+, Mr. Schue! 5. “Crush”: It’s scary how much Lea Michele sounds like Jennifer Paige when she sings this song. Scary, yet also fantastic. Lea nails the raw sexiness of this song and I love it. 7. “Lean On Me”: From the opening “hum hum hums” to the closing “chocolate thunder-esque” moment by Amber Riley, I love this entire song. Again, Kevin and Amber sound ridiculously awesome sharing lead vocals. This song is super emotional and super fun all at the same time. 8. “Don’t Make Me Over”: For those of you scratching your heads trying to remember what episode this song was in, you can stop messing up your hair. This song was cut from “Hairography,” but was left on the album. And while I find that situation a bit odd, I think Amber Riley does an awesome job on the song and I love how drastically different it is from her usual selections, so I’m down with it. "Imagine": I'll bet you couldn't keep your eyes dry when the gleeks joined the deaf choir in singing and signing this song. 9. “Imagine”: Beautiful, simply beautiful. I do wish, however, that the album version was the same version as was in the episode, but unfortunately only the gleeks sing on this track, not the deaf choir as well. Still, it’s a gorgeous song that’s bound to draw a few tears. 10. “True Colors”: Jenna Ushkowitz finally gets lead vocals! Woo! I know “Imagine” is the more traditional tear-jerker in this episode, but this song gets me going just as much. Jenna takes the lead beautifully and it’s one of my faves from the album. 11. “Jump”: Admittedly, this song is better with its accompanying video because the mattress jumping is absolutely fantastic, but this song is still ridiculously fun on its own. All of the gleeks hold their own on this ensemble track and I love jumping around my apartment while listening to it! 12. “Smile (Lily Allen version)”: I love the original version of this song, but the Lea/Cory duet just doesn’t work very well for me. I don’t think the song suits either of their voices particularly well, and it’s really just a so-so performance for me. 13. “Smile (Charlie Chaplin version)”: All of the gleeks sound rather lovely on this track, but still the song is only average for me. It just doesn’t seem to hit me in any memorable way, unfortunately. 14. “And I Am Telling You”: Amber rocked this and you all know it. Is there really anything else to say? I’m not even a huge Mercedes fan, but during this performance I was cheering for her along with everyone else because it was just so damn awesome. 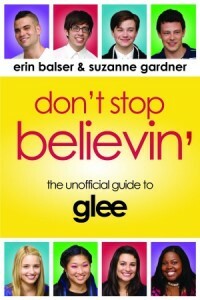 "You Can't Always Get What You Want": Ladies and gentlemen, New Directions! 16. “You Can’t Always Get What You Want”: Solidly fun track by the whole gleek crew. A much better song for Cory and Lea to share lead vocals on than “Smile,” as it suits Cory’s rock sensibilities.